Host nation Brazil will kick off next year’s soccer World Cup against Croatia in Sao Paulo on June 12 and the favourites will be happy with a Group A also containing Mexico and Cameroon as they seek their sixth title. Friday’s complicated draw procedure went off smoothly as holders Spain and 2010 runners-up Netherlands were put together in the group stages, but have a tough task with Chile and Australia alongside them in Group B.
England, Italy and Uruguay, all former winners, were put together, along with Costa Rica, in Group D, with England facing Italy in the jungle city of Manaus in their first game. A meeting with Uruguay, the 2011 Copa America winners and semi-finalists at the last World Cup promises to be a hard enough test for England in their second match in Sao Paulo on June 19. “It’s a tough group, there’s no doubt about that,” said England coach Roy Hodgson, whose team also face Costa Rica. Germany will come face to face with their former striker and coach Juergen Klinsmann, now in charge of the United States, with Portugal and Ghana completing the Group G lineup. The two European nations will meet in their first match in Salvador on June 16. The draw was kinder to host nation Brazil, however, as they seek to make up for their failure to lift the trophy when they last hosted the finals back in 1950. After scraping through qualifying via a play-off, France were drawn in Group E with neighbours Switzerland, Ecuador and Honduras. 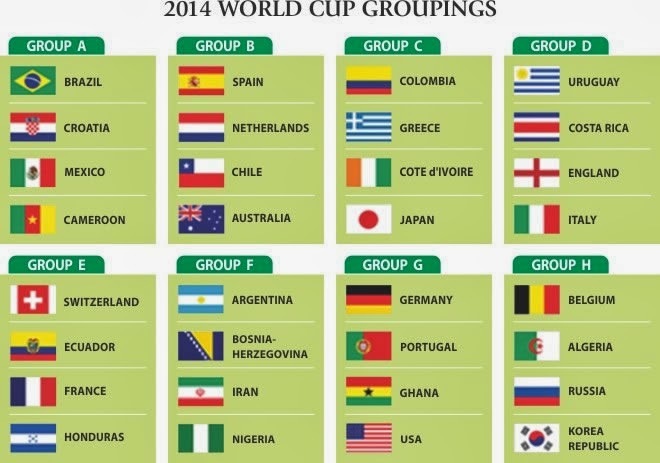 Colombia will face Greece, the Ivory Coast and Japan in Group C, while Belgium, another of the potential dark horses, will meet Algeria, Russia and South Korea in Group H.